Here we are again. It’s June, and the Atlantic hurricane season is upon us. Perhaps that grabs your attention more than ever, just as it does mine. Hurricane Matthew’s catastrophic sweep through our town last year created a lasting impact. Our town manager, Steve Riley, and Tom Dunn, our emergency management coordinator, have delivered pertinent information for me to share with you at the onset of this unpredictable season. First, your town takes critical steps periodically throughout every year to prepare for potential storms. Emergency Operation Center and evacuation procedures are reviewed and exercised annually. This occurred early in 2016, and then, of course, we fully utilized the plan when Hurricane Matthew hit us in October. That same review and evacuation exercise is planned for October this year. A meeting and training session with our Emergency Operations Center and other critical staff also takes place annually. This allows us to review the current plans and provide new and necessary information to everyone. Critical partners, including the utility companies, medical facilities, POA security forces and others, are engaged to consider the plan and incorporate new and valuable information. With each step, we are better equipped to respond. Other crucial steps are continual, such as practicing hurricane protection installation procedures on vital facilities like fire stations. And inventorying essential supplies enables us to make sure that the Emergency Operations Center is fully prepared at all times. Next, the work done in advance and in response to the devastation of Hurricane Matthew demonstrated just how well Hilton Head Island prepares for the Atlantic hurricane season. No major changes are currently contemplated, though reviews and evaluations occur after every event or exercise. Hurricane Matthew did reveal opportunities to improve processes, such as better collection and sharing of information on social media and other interfaces. Clearly, identifying work that the evacuated staff can accomplish remotely before, during and after a storm will be of great benefit to the community too. Finally, citizens should likewise prepare for the season now, and the town has resources available to assist. The “Citizen’s Guide to Emergency Preparedness” is available in English and Spanish and can be used to help develop a personal preparedness plan. Find it on the hurricane page of our town website at hiltonheadislandsc.gov/publicsafety/hurricane. Other resources available there include a link to the South Carolina Hurricane Guide and FEMA. If you evacuated last October, review how it went and determine what improvements could be made. Or, use our preparedness guide to strengthen your plan or build a new one. Be ready the next time an evacuation is suggested or required. Some debate the necessity of evacuation. Please remember that your life and the emotional and physical well-being of your family members and friends are of the utmost value. Likewise of paramount importance are the lives and well-being of our first responders and their family members and friends. Lives are irreplaceable. If and when the governor issues an evacuation order, you should readily comply. Staying behind is a great risk, not just for you, but also for others. And resources necessary for the re-entry and recovery efforts being made on behalf of all Hilton Head Islanders must be diverted to those who did not evacuate. So, here we go again. If we do our job right, nothing happens. That is the motto of the town’s building inspectors. 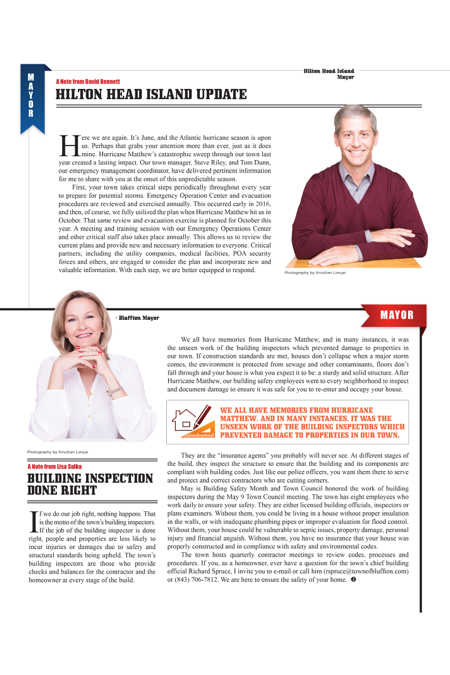 If the job of the building inspector is done right, people and properties are less likely to incur injuries or damages due to safety and structural standards being upheld. The town’s building inspectors are those who provide checks and balances for the contractor and the homeowner at every stage of the build. We all have memories from Hurricane Matthew, and in many instances, it was the unseen work of the building inspectors which prevented damage to properties in our town. If construction standards are met, houses don’t collapse when a major storm comes, the environment is protected from sewage and other contaminants, floors don’t fall through and your house is what you expect it to be: a sturdy and solid structure. After Hurricane Matthew, our building safety employees went to every neighborhood to inspect and document damage to ensure it was safe for you to re-enter and occupy your house. They are the “insurance agents” you probably will never see. At different stages of the build, they inspect the structure to ensure that the building and its components are compliant with building codes. Just like our police officers, you want them there to serve and protect and correct contractors who are cutting corners. May is Building Safety Month and Town Council honored the work of building inspectors during the May 9 Town Council meeting. The town has eight employees who work daily to ensure your safety. They are either licensed building officials, inspectors or plans examiners. Without them, you could be living in a house without proper insulation in the walls, or with inadequate plumbing pipes or improper evaluation for flood control. Without them, your house could be vulnerable to septic issues, property damage, personal injury and financial anguish. Without them, you have no insurance that your house was properly constructed and in compliance with safety and environmental codes.